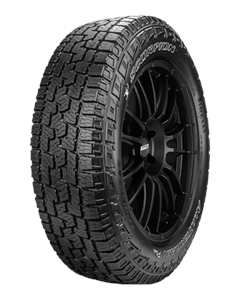 The new Scorpion™ All Terrain Plus combines Pirelli's advanced compound and design technology with an aggressive appearance to provide light truck and SUV owners with a durable All-Season tyre, and a high performing driving experience through a wide range of challenging on or off-road conditions. Sporting a new generation tread compound and aggressive design, the Scorpion™ All Terrain Plus tyre represents a totally new product with a significant upgrade in terms of off-road performance in respect to the previous Pirelli Scorpion™ ATR. The brand new tread pattern increases durability, traction and wear resistance, offering high performance in snow, off-road and muddy conditions. In terms of usage ratio, the new Scorpion™ All Terrain Plus is a 60% off-road and 40% on road product. Sorry, we currently do not have any tyres with the Scorpion AT Plus pattern in stock.